Outfield drills are now more important than ever because baseball has changed back to a speed and skill game. Colleges and major league teams are no longer looking for the big basher, they want good defensive outfielders. Of course, catching a fly ball or line drive is the number one priority of outfielders. But even at the ages of nine and ten it is time to start having drills for outfielders. Typically at those young ages the best fielders are placed on the infield, and for good reasons. More hits do stay in the infield. But youth teams need to spend more time on drills for outfield. Not all those good fielders are going to stay on the infield in later years. Expose all your players to drills for outfielders. Just like pitchers take years to develop, so do position players. 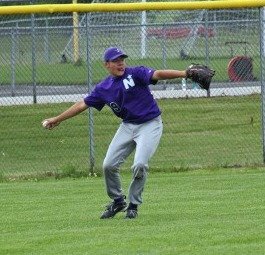 Many fourteen or fifteen year olds find themselves trying to make the high school baseball team by playing the outfield. They can hit their way onto the team, but the infield is full of upper classman. It sure would be great for them if their little league coach had included them in outfield drills. They would be confident about playing the outfield, not worried and nervous. This just might be their best chance of making the team. High schools teams are just like all other teams, they can only hide one poor defensive player as a DH. Here is a competitive drill that is for outfielders and simulates game like conditions. Be sure your outfielder’s arms are warm before starting this drill. Place your outfielders in a line behind each other in right field. Put an infielder at third base and a runner at first. You or one of your coaches will hit the baseball to right field. The runner tries to advance to third base and the fielder makes the throw to the bag. He is safe or out, you make the call. You control how hard this drill is. A tough hit to the outfielder will make the drill tougher. And you can tell the runner there is one out or two outs. With two outs he is running on the hit. With one out he has to wait to see if a catch is made. If you are saying only one out, add a first baseman to double off the runner. These are different variables that you can try with this outfield drill to help control the degree of difficulty. You could add a second baseman and catcher and hit the baseball long for a play at the plate. Once you try this drill and see how your team reacts, then you will have a better idea what you can do. Try to keep this drill moving with not much time between repetitions. Boys standing around will get bored and stop learning from the drill. Give positive feedback to each fielder, and then move on. Not every player has a right fielder’s arm. It is a long throw from right field to third base, and I suspect many players won’t make it all the way. So move some of the weaker arms (don’t tell them that) over to left field. Put a runner on second for this drill. Hit a fly ball or line drive to the left fielder. Have the runner at second tag up and move on to third with the catch. Good outfield drills should be a positive experience for everyone. If some of the arms have not matured enough to make the throw from right, then by all means move them to left.